I’m excited to partner with Kellogg’s Frosted Mini-Wheats to bring you this idea. I’ve always loved back to school season. I love that there is a cool crisp in the air again. I love getting fun supplies for class. I love all the learning that’s about to happen and all the friendships about to be made. Prepping for back to school is always a fun to do in our house. All the boys love picking out new back packs, supplies and new clothes. Even though I enjoy prepping for back to school, it’s a lot of work. 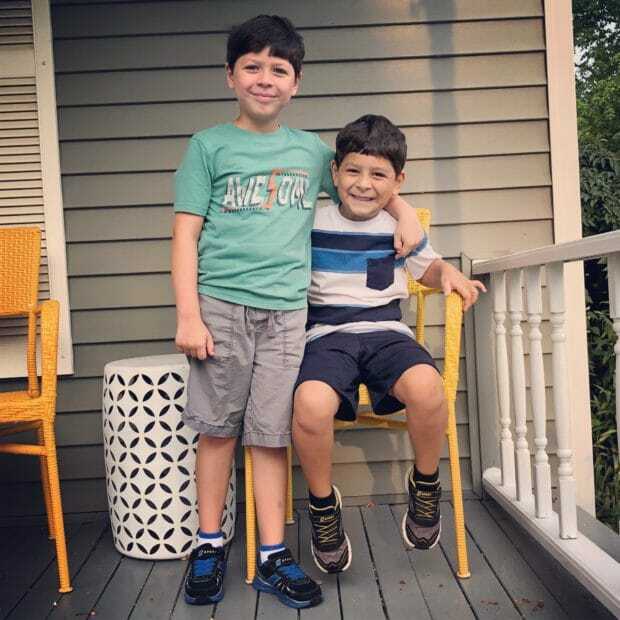 I often stop to think about how much effort I put into getting three boys ready… and then think about the teachers they’re heading to. They’re preparing for lots of kids — not just my three. 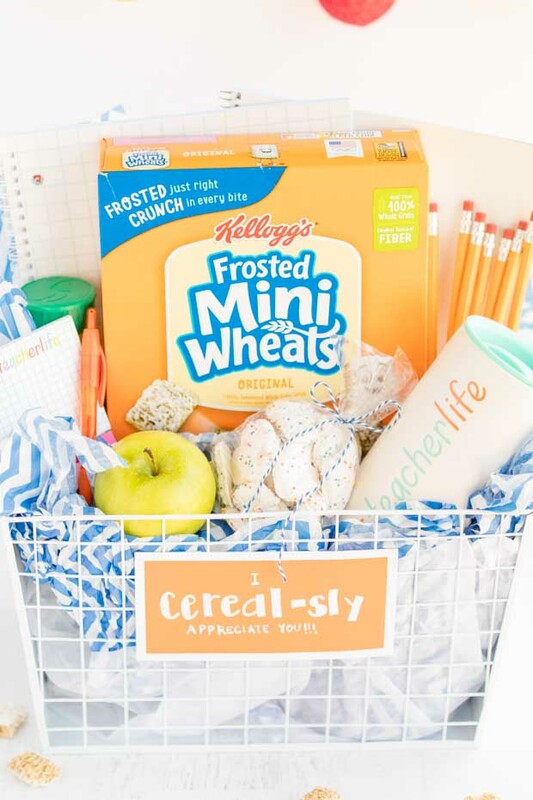 If you know an amazingly dedicated teacher like that, take a moment to nominate them for a chance to receive a Kellogg’s Frosted Mini-Wheats back to school bundle including supplies and the filling breakfast of wholegrains, fiber and protein they need for their BIG day — worth over $500! Give your kid’s teachers a heartfelt “thank you” the next time you see them! It’s a simple way to let them know how much they mean to you. As I was so inspired by Kellogg’s Frosted Mini-Wheats bundles, that I decided to create my own as a small token of my appreciation for my boy’s teachers this fall. A “thank you” for all they do — inside and outside the classroom all year long. The first day is a big day — and we all need energy to power through. 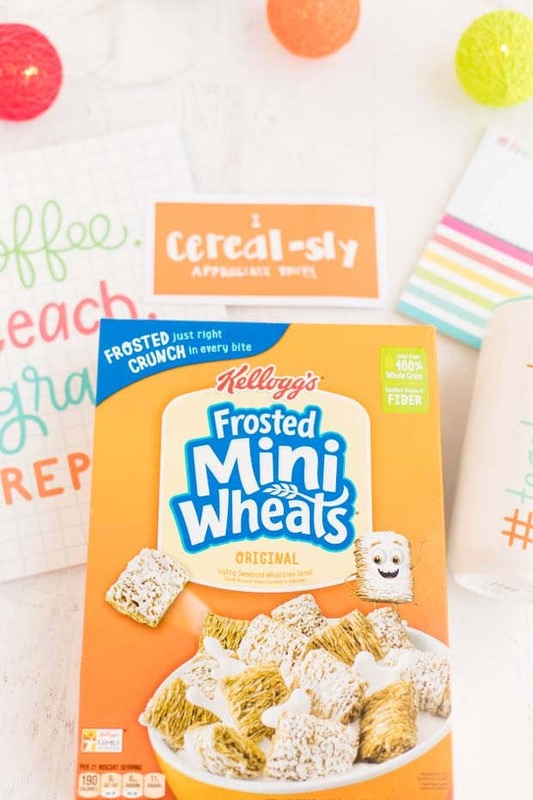 Kellogg’s Frosted Mini-Wheats is the perfect way to start the day. A bowl packs in 43g wholegrain, 6g of fiber, and 5g protein. 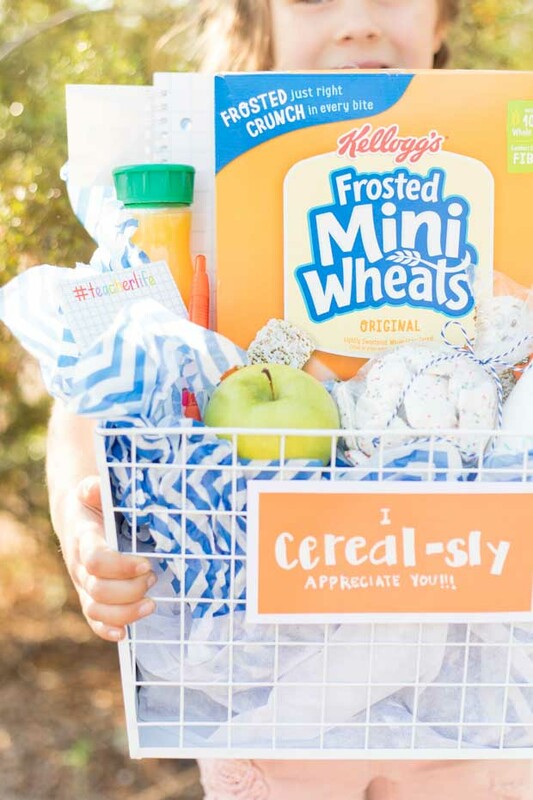 This basket is packed with fun treats — cute supplies, a fun mug and of course, the filling and delicious Kellogg’s Frosted Mini-Wheats. This back to school bundle will brighten your favorite teacher’s day and help give them the energy you know they’ll need to have a successful day! My youngest son’s kindergarten teacher last year was a girl I’ve known my whole life — her mom was actually one of my teachers in middle school! 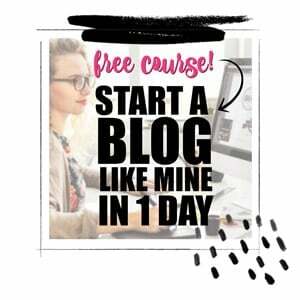 We follow each other on social media… and I was routinely blown away by how much training she was doing over the summer. She regularly posted books she was reading and classes she was taking to help her be the best teacher she can be. Of course she’s having summer fun with her family, too. But just because it’s summer doesn’t mean she’s off work. 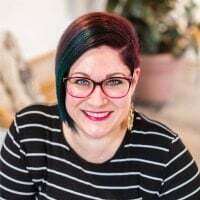 She has been putting in a lot of energy getting her skills and classroom ready for the kids returning to her care this fall. How are you planning to help prepare amazing teachers for this back to school season?